Omnivore Recordings has taken on the task of giving new life to albums that have a cult-type following. Around the same time last year, Omnivore Recordings remastered two of the late eighties albums from alternative rockers Camper Van Beethoven. This time around, they look to expand upon the band's 2004 reunion album "New Roman Times." Due to tension within the band, Camper Van Beethoven called it quits in 1990 following the tour behind their most successful album "Key Lime Pie." In 2002, the band reunited for a tour and an album called "Tusk," in which the band re-recorded the classic Fleetwood Mac album. Their first proper release of brand new material since getting back together came in the form of "New Roman Times." The album contains the concept of the U.S. being split into two separate countries of right-wing Christians and left-wing utopians. The original twenty song release sees its first release on vinyl and gets expanded on CD with four bonus tracks from the recording sessions for the album. It seemed that the band tackled this album with a new sense of purpose as the music still resonates with today's modern rockers. Camper Van Beethoven wastes no time bringing their worldly sound into play with the opening instrumental "Sons Of The New Golden West." The band still show their teeth on the guitar driven rocker "White Fluffy Clouds," before the story gets laid out with Latin flavor of "Might Makes Right" and the fun country jaunt of "Militia Song." The music jumps through many different genres like the European feel of "R'n'R Uzbekistan," the experimental sound piece "I Hate This Part Of Texas" and electronic dance rock of "Discotheque CVB." 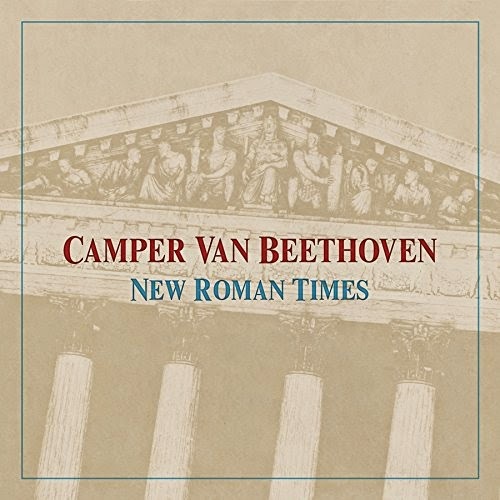 The bonus tracks are a welcome addition as they continue to show the wide range of Camper Van Beethoven's songwriting ability with the surf-guitar, punk-like feel of "It's Gonna Rain" and reggae tone of "Might Makes Right Dub" remix. To find out more about this latest release from Omnivore Recordings, please visit omnivorerecordings.com.